The oft-repeated claim that light rail has generated $7 Billion dollars in economic development is simply untrue. In fact, many of the projects included in this claim have never been built (like the Sycamore Station development) or involve projects that have nothing to do with light rail (such as the $600 million Convention Center Expansion, which was funded largely by state tax dollars). The main beneficiaries of the transit plan appear to be contractors and developers who have projects near rail stations. The tax revenue from the plan combined with the generous subsidies offered to select developments ensures that this plan will benefit a few contractors and developers at the expense of others. The plan is unbalanced and ignores vehicle street improvements. Despite the fact that only 3% of the population uses transit (less than 1% use light rail), 95% of the funding in the plan goes toward expanded bus and rail service. Only 3% goes toward vehicle street improvements. 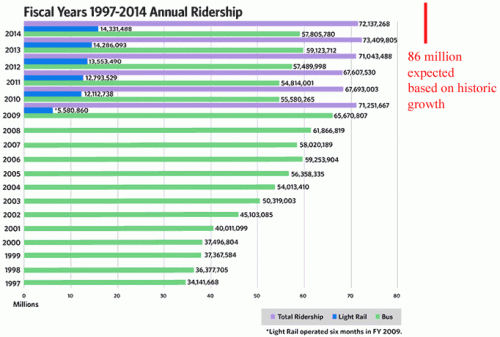 Transit ridership actually fell after the light rail opened. From when light rail opened in 2009 through 2014, any gains in light rail ridership were offset by the loss of more than one bus rider. 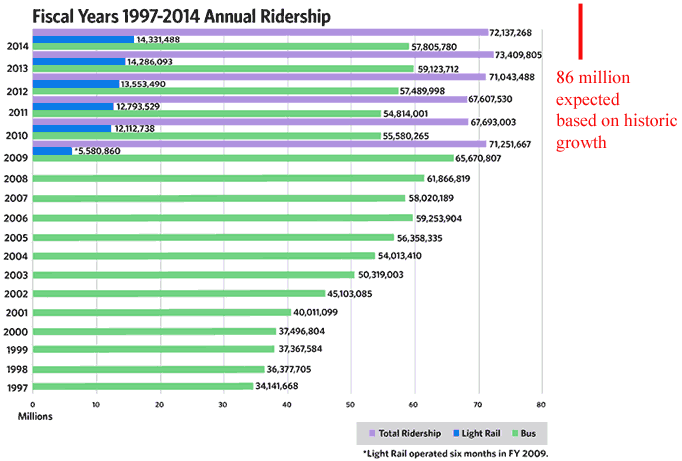 Ridership is still 1.2 million less per year than it was in 2009. According to the city of Phoenix and Valley Metro, light rail is a great success in Phoenix, generating a 42-percent increase in transit ridership since 2001 and stimulating the construction of $7 billion in new real estate development along its route. A close look, however, reveals that both of these claims are wrong. The increase in ridership took place between 2001 and 2009, the (fiscal) year that the light-rail line opened. Since that year, for every light-rail rider gained, the region’s transit systems lost more than one bus rider. Per capita transit ridership has declined by 8 percent since 2009 partly because the high cost of light rail forced a 34-percent increase in average bus fares by 2010 and an 18-percent decrease in bus service by 2013. You can see this perfectly well from a chart right off of our transit authority's web site (except for my annotation in red), which I discussed in depth here. It is just incredibly disingenuous that light rail supporters are trying to claim credit for transit ridership increases that occurred before the line was built and whose growth the line essentially halted. Much of this development is subsidized by various government programs. It is impossible to separate the effects of the subsidy from the rail line. So what does one get for the 5x higher operating costs and 134x higher capital costs of light rail over buses? Well on the negative side, one gets a system that is substantially less flexible and responsive to changes. The only positive I can come up with is that middle and upper class white people consider buses low class and want a transportation mode of their own. Once Tempe officials determined the fish that remained in Tempe Town Lake would not survive a possible rescue mission, they decided to dispose of them in what they deem to be the most natural way possible: by feeding them to an alligator. Hundreds and possibly thousands of fish were left in small pools scattered throughout the 220-acre lake after one of its dams breached Tuesday night and sent nearly a billion gallons of water cascading down the normally dry Salt River.